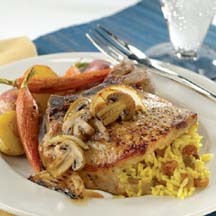 CooksRecipes has quality, kitchen-tested recipes for stuffed pork chops that you can count on for successful deliciousness. A simple, but flavorful stuffing is a great way to keep chops ultra moist and flavorful while grilling. 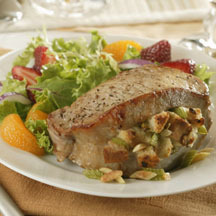 Stuffed pork chops with a basic bread stuffing enhanced with almond flavor and crunch. 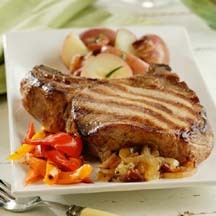 Recipe from Michaela Rosenthal, winner of The National Pork Board's "America's Favorite Family Recipes Contest".